Your Roof is Failing - Is it Time to Call the Experts at Livingston Roof Pros? Your Roof is Failing – Is it Time to Call the Experts at Livingston Roof Pros? The roof on your home is one of the most important components. It protects the inside of the home from all the weather that happens on the exterior of the home. This includes water from rain, snow, and ice. And also includes protection from the cold of winter and heat of summer. When your roof fails it can cause all sorts of damages to the inside of the home. Being able to determine when your roof may be failing and you need to call a roofing contractor can help protect your home and prevent a roof leak from occurring on your home. If you do suspect there is a roof leak on your home be sure to call the experts at Livingston Roof Pros for a roof inspection today. As we all know, a house is comprised of some basic components; the walls, windows, doors, and roof. All of them are equally important, and if only one of them starts presenting issues, then your family’s health and wellbeing is endangered. A broken window lets the cold air to flow in, a damaged door is more vulnerable to weather damage and thieves, while a failing roof enables rain and cold to pass through. In the case of a failing roof in Livingston MI, the wisest move is to call a certified expert such as Livingston Roof Pros to help you fix it. There are other ways around it, but they are not so durable nor recommended. Should You Fix it Yourself or Contract with a Roofing Company Like Livingston Roof Pros? Money is an issue for many people nowadays, hence the reason why it can be tempting to consider fixing the roof by yourself, especially if you have some technical knowledge. However, there are a couple of things to keep in mind here. First of all, it is difficult to do it all alone, since roofs are tricky places where its easy to slide and get hurt. Secondly, you lack the adequate equipment to perform the work. Thirdly, you do not have all the necessary fixtures and advanced solutions that a technical contractor benefits from. Therefore, the most logical solution in this case is to contract a company which has the experience, equipment and personnel to help you up. Is there a Warranty or Guarantee on the Work? Some people wonder whether contractors offer some warranty for the provided work and what happens in the unlikely case that they damage something during their operation. Most of the roofing material manufacturers will have warranties on the products they sell. However, in order for these warranties to be honored the roofing materials must be installed correctly by qualified roofers. Improper installation of your roofing materials could void the warranty on your entire roof. So always use a licensed roofing contractor such as Livingston Roof Pros to install a new roof on your home. When it comes to fixing a failing roof, the most important thing is to check the area which is damaged. Sometimes it’s impossible to see all of the damage with your plain eyes, since modern roofs are complexly installed and only a specialized technician can see exactly where the damage persists. As a result of this aspect, a contractor will be unable to tell you the costs over the phone, and in best case scenario will give you a range of costs based on your roof’s overall diameter. However, if you want an exact evaluation and a precise cost, then it’s recommended to ask for a location checking of the roof, which is usually free of charge if you decide not to continue with the repair. Sometimes you will be required to pay the trip of the expertise team, and the overall checking procedure if it takes a lot of time. However, these details can be discussed over the phone with your chosen company. 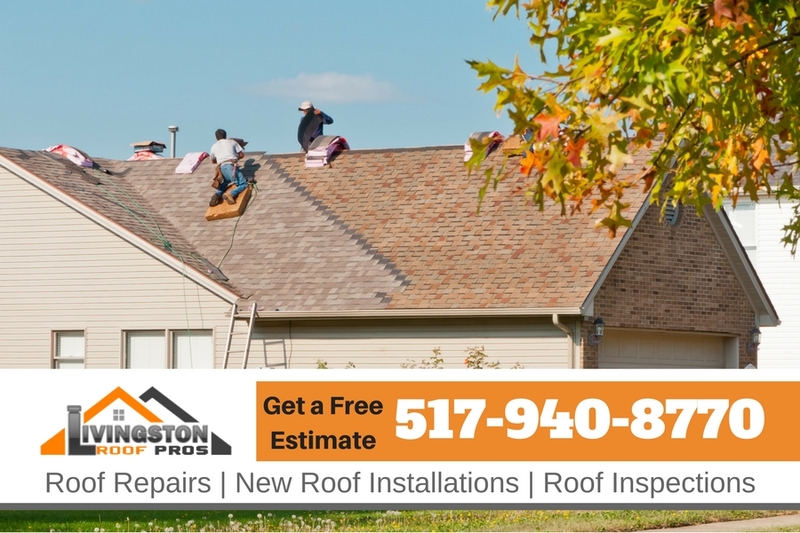 Call Livingston Roof Pros today for a free estimate on your roofing project. We are a fully licensed and qualified roofing contractor ready to help you protect your home with a new roof installation or roof repair.